A group of rail users has voted to go on a fare strike on Monday in protest at delays and overcrowding on trains run between Bath and Bristol. The commuters decided at a meeting on Tuesday evening to take the action. First Great Western (FGW) customers have faced weeks of problems following timetable changes. There are also problems with broken carriages. FGW said customers needed a valid ticket to travel. Those without risk a £1,000 fine or three months in prison. In a statement, the train operator said: "Customers need a valid ticket to travel on all FGW services. Those without a valid ticket risk prosecution - the maximum penalty is a £1,000 fine or three months in prison and a criminal record. It is a criminal offence not to buy a valid ticket." FGW said its engineers had been working round-the-clock to get rolling stock back into service. Commuter Theresa Hopkins who holds a season ticket has taken to driving into work from Frome rather than using the train to Bath Spa. Keynsham to Cardiff Wednesday 10 January 0713 GMT "0713 comes and goes but no train. It finally arrives at 0812 and is totally overcrowded and unable to squeeze more on. Still over 60 people on the platform. Get to the office 75 minutes late." Bath to Bristol Tuesday 9 January 0822 GMT "The train is full with people standing. There are 40 people standing in my carriage - this must be a safety issue?" Return 1722 GMT "Could not physically move. The train would not depart unless people got off - several people got off." "While I've got the use of a car I'm going to continue to use it because using the train means I'll be late into work again and again," she said. FGW has recognised the problem and apologised to passengers and its staff. In a letter sent to staff it said: "We've had serious problems with the reliability of the Sprinter fleet and I recognise this will have caused you all concern and embarrassment in front of our customers." Andrew Griffith of FGW said: "The engineers have been working round the clock and I'm very confident now that the end is in sight in terms of getting enough carriages out into traffic each morning." First Great Western has also announced it is to invest £63 million on the redesign for the trains on its high-speed fleet which will provide an extra three million seats a year. But commuters calling themselves More Trains Less Strain believe a lot more needs to be done by FGW to make passengers happy again. 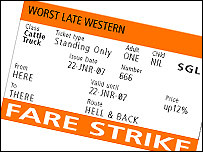 "We want people to demonstrate peacefully - to take a fare strike ticket (a fake ticket printed by the group) on Monday which won't have any monetary value but will hopefully mean they wont have to buy a ticket," said Simon Carpenter of More Trains Less Strain. "It's our way of demonstrating and saying we don't value the existing service. "The tickets will be issued in the morning at Bath Spa, Oldfield Park and Keynsham stations between 7.30 and 8.45," he said.